During a lifeboat drill at sea in good weather conditions, the starboard lifeboat was lowered to the embarkation deck. 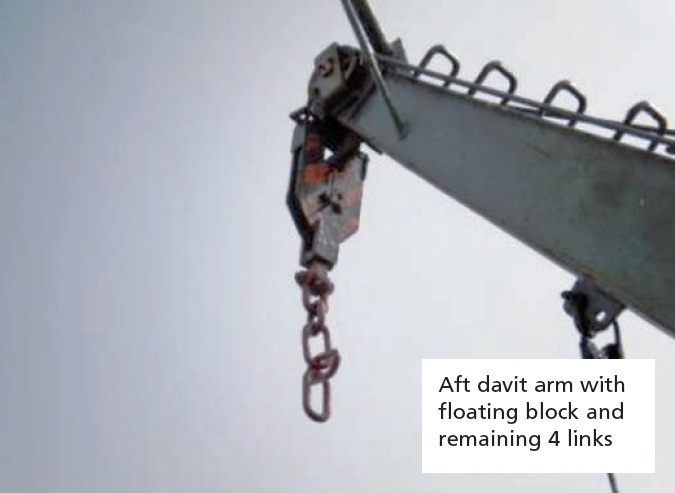 In this operation the top link of the forward chain for the connection between the davit floating block and the hook on the lifeboat parted, such that the entire load from the lifeboat was transferred to the aft hook/chain. As the aft chain could not withstand the excessive weight, the lifeboat accidentally dropped to the sea. No crew members were on board the lifeboat at the time of the accident and no human injuries occurred. 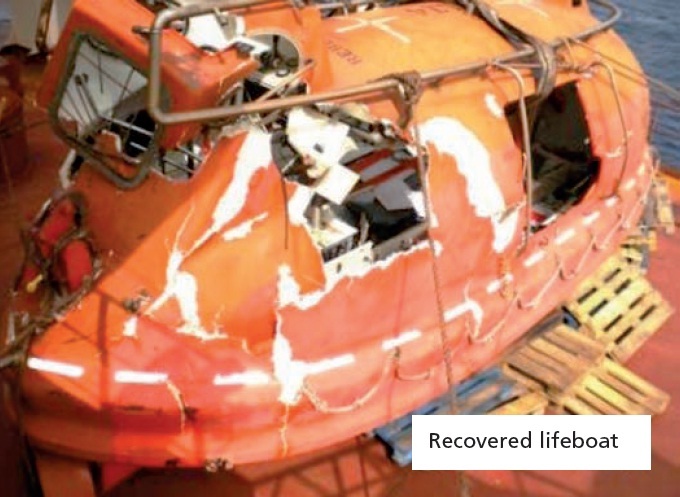 The lifeboat was considered a total loss due to extensive damage caused by the drop of the lifeboat from the embarkation deck level to sea level. It is likely that the top link of the forward chain parted due to corrosion or damage of the welding of the link such that the load was no longer distributed to both sides of the link. As the links/chain were painted it was probably difficult to detect the fracture that had developed over time. 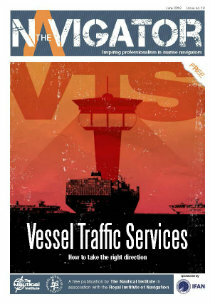 The Maritime Administration allowed the vessel to sail with an exemption certificate until a lifeboat could be put on board, provided that additional life rafts and immersion suits were in place. 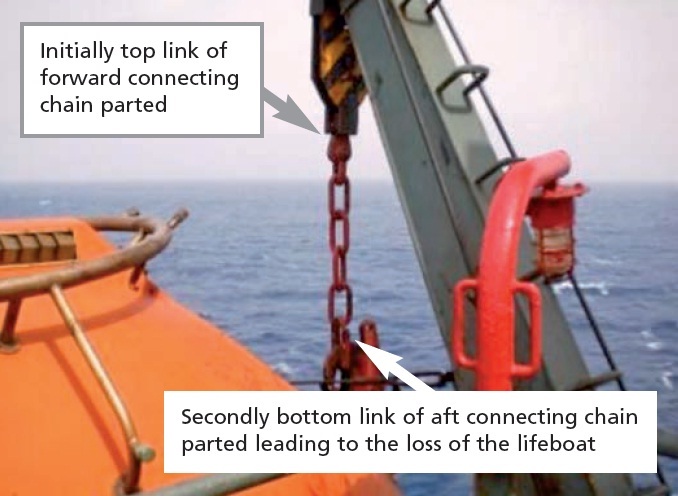 It is recommended that chains are either replaced or tested by DPI / Ultrasonic testing at regular intervals to eliminate / detect parts with potential risk, this should then be included in the ship’s maintenance system. 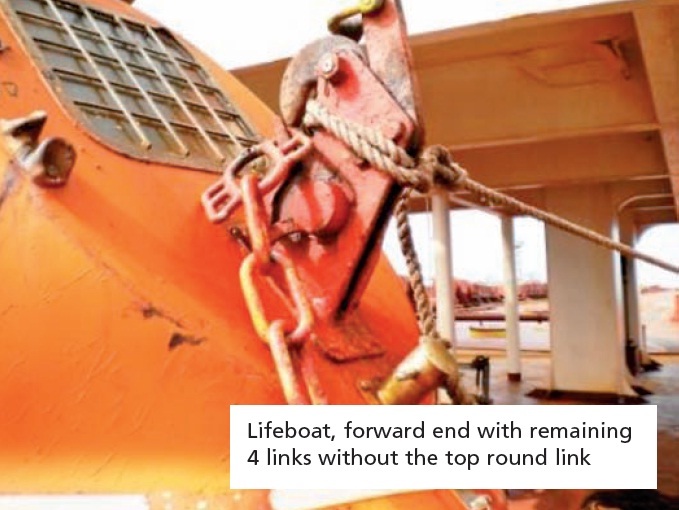 The lifeboat chain, hooks and release system should be inspected and maintained according to maker’s recommendations, and be included in the ship’s maintenance system. It is recommended that lifeboats are lowered without person in the lifeboats and boarding is carried out after the boat has been lowered.